10:45 - 11:00 Catuscia Palamidessi Bayesian risk in information hiding. 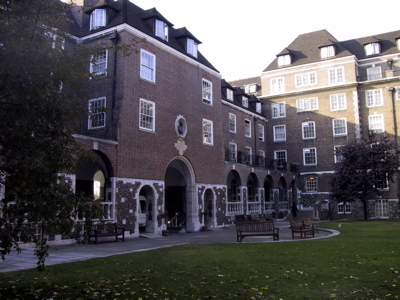 The workshop will be held in central London in the beautiful location of Goodenough College on the 30th of March 2009 (Talks will be in the London house small common room). The workshop is sponsored by EPSRC and will be free to participants. To register email the organizer Pasquale Malacaria pm@dcs.qmul.ac.uk (there is a limited capacity, places allocated on a first come first serve basis). Geoffrey Smith will be the invited speaker. Goodenough College has good visitor rooms; rates and availability on this link . Additional hotels in the area around the venue (Central London) can be found on tripadvisor here. Tripadvisor, thanks to the revues, provides a pretty faithful description of the accommodation. Interference and dependence are closely related concepts, the first being the observable phenomenon connected to the second. Interference essentially means that behaviour of some parts of a dynamic system may influence the behaviour of other parts of the system. Dependence specifies the relation between the semantics of sub-components of a dynamic system. Discovering, measuring and controlling interference is essential in many aspects of modern computer science, in particular in security, program analysis and verification, debugging, systems specification, model checking, program manipulation, program slicing, reverse engineering, data mining, distributed databases and systems biology. Doing these things requires theories, models and semantics for interference and dependence, as well as algorithms and tools for analysis and reasoning about interference and dependence. The aim of this workshop is to gather together the community of people that study dependence and interference from the different points of view in order to generate new possible research directions. PLID is devoted to bridging all these communities and assisting work towards a common goal, providing the appropriate environment for reasoning about the state of the art in interference and dependence.